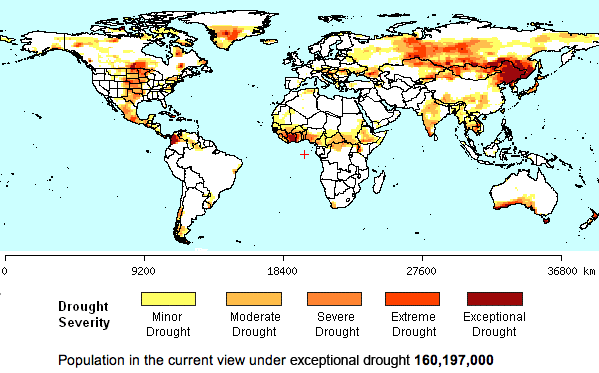 Objective: Explain the characteristics and describe the global spatial distribution of drought. Starter: Click here to access an infographic on the characteristics of drought with a focus on the current situation in California, USA. Task 1 - Complete the worksheet beneath using the resources on this page to help you. Before you start on the climatic tasks, be sure to check out the two explanation videos beneath. Information on the ITCZ and atmospheric cells. Extra: Watch the David Attenborough video, below right as well as the Why Does the Earth have Deserts video and then turn to David Waugh - Integrated Approach page 226. Use this sheet to complete your diagram. The diagram below will also help you. Help needed: Download and read this IB essay carefully. Use a highlighter to show physical causes, human causes, effects and management strategies. Objective - To complete a short study on the likely success of drought prediction and where this has been implemented. We know that drought have medium to long term speeds of onset (known as a creeping phenomonen) and are not immediate hazards like earthquakes. However, with advances in meteorology, can we predict this onset and warn vulnerable populations? Task 1 - Complete all tasks set out in the worksheet above right. You will need the resources on this page to help you. Read this article from the National Drought Mitigation Centre. Outline the issues in predicting drought and any potential successes. Watch the YouTube video above about drought prediction in African countries and create a short case study using the content. Cover the social and economic effects as well as methods being used to reduce the problems. Objective: To relate global warming issues with frequency of drought events in Africa. The tasks for this section will be completed on the same worksheet for the tasks above on frequency. You will need the resources below to help you. Read this article from Science Daily. a. Think about the potential relationship in the frequency of droughts in Africa and global temperature rises. b. Think about how many people are likely to suffer food shortages in the Horn Of Africa as a result of this hazard. c. What is the relationship between food shortage and drought?